This work is a sequel to his best selling autobiography Apprenticed to the Himalayan Master. New Delhi: An overflowing hall, packed through the aisles, clapped and cheered as Dr. Karan Singh, Member of Parliament, Rajya Sabha unveiled “The Journey Continues”, the eagerly awaited sequel to author and spiritual guide Sri M’s autobiography at the India International Centre on Thursday. The launch was followed by an engaging dialogue with Sri M, who kept the audience enthralled with his fascinating accounts of spiritual encounters and near surreal experiences. The book is a sequel to Sri M’s widely read and critically acclaimed bestseller Apprenticed to a Himalayan Master. Under the gentle probing of journalist and author Sudhamahi Reghunathan, Sri M touched on a wide range of subjects, including the fascinating issues of rebirth and astral travel that he has recounted in his book. “When the mind becomes still with practice, the natural ability to recollect the past, including even past lives becomes a possibility. To validate my thoughts and recollections I make it a point to go and verify details of locations and local historical facts of my past life, wherever possible,” he said. He said the purpose of writing the book was to enable an expansion of consciousness and help people understand that there are realms beyond those ordinarily perceived by the limited five senses. Speaking on the occasion, Dr. Karan Singh shared, “I met Sri M 20 years ago and have remained closely associated with him ever since. 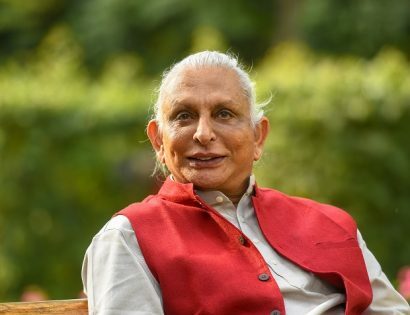 I applaud him for his very enlightened narratives that make all his books instant best sellers.” He added that he held Sri M’s commentaries on the Upanishads in very high regard. The Journey Continues traces the evolution through many lifetimes of Sri M, a yogi with profound knowledge of the Upanishads and deep personal insights, born of first hand experiences with higher levels of consciousness. While the earlier book dealt with his extra ordinary life experiences and spoke of the metamorphosis of the young Mumtaz Ali into Sri M, the sequel opens up greater vistas of consciousness and credibly questions the parameters and limits of modern science. Comprehensive in style, spiritual in content, yet written in spellbinding fashion, The Journey Continues brings hope to humankind through the narration of the fascinating spiritual experiences of its author. The book creates awareness of a world beyond limited human understanding by recounting Sri M’s encounters with great yogis including Sri Guru Babaji and Maheshwar Nath Babaji, besides providing glimpses into his past lives. As a social reformer, educationist and spiritual guide, Sri M’s discourses weave together multiple strands of society, not confining himself to Yoga and the Upanishads alone. He quotes extensively from the religious traditions of Buddhists, Christians, Sufis, Jews and all other faiths. In furtherance of this endeavor, Sri M has traversed 7,500 kms on foot across the country from Kanyakumari to Kashmir touching the lives of more than 10 million Indians and bringing to them the unifying message of their common humanity through the inspiring Walk of Hope. The 15 month walk, successfully completed through 2015-16, sought to spread peace and harmony for a better India and a better future for the younger generations. Earlier this year, to spread the same message in Europe, he took the Walk of Hope to Berlin, Germany and The Hague, Netherlands. Sri M’s Satsang Foundation in Madanapalle, Andhra Pradesh, runs The Satsang Vidyalayas, providing free, high quality, multi lingual education for tribal children from rural areas and the Satsang Swasthya Kendra to provide free medical services for the poor. Two other recent initiatives of the Foundation include Mythri, a large-scale re-forestation programme, and the setting up of a medical centre for the needy on the outskirts of Bengaluru. Sri M has also started a Sarva Dharma Kendra on the outskirts of Bengaluru to facilitate dialogue between religions and help in underlining their essential unity. The Foundation hopes to establish many such Kendras across the country. 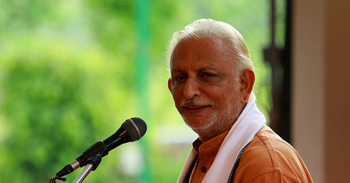 After the announcement of the new initiative at the book launch, Sri M inaugurated the Chanda Satsang Vidyalaya at Garh Mukteshwar in Uttar Pradesh on Friday, the 30th of June. The school will be run under the aegis and format of the Satsang Vidyalaya in Madanapalle providing free quality education, following the organic play way system of learning and serving a nutritious mid-day meal to all the children.